Juice Point was founded in 2009 by Mark Yates. His vision is an integrated smart grid comprising intelligent EV chargers integrated with solar, static batteries and carboNZero certified electricity from Ecotricity. EV Smart Chargers are currently sourced from eMotorWerks and Tritium. Grant Crawshay joined the company in 2015 and introduced the eMotorWerks range and JuiceNet, the smart grid enabled energy management system in conjunction with Paladin. In 2016 JuicePoint began manufacturing in New Zealand the JuiceCord portable unit, and the WORX 22kW FAST Type 2 EVSE. Both are sold locally and exported to international markets. Strategic relationships continue to be developed with the vehicle industry, the electricity sector, public parking organisations, government entities and EV users. Grant has also worked very closely with eMotorWerks to customize the products for the New Zealand and Australian market. In early 2018 the regulatory framework for New Zealand was clarified, and Nick Murray joined to assist Grant and Mark to take JuicePoint forward as the EV adoption rate in New Zealand ramps up. New Zealand is also following Europe with Type 2 charging connectors for vehicles. 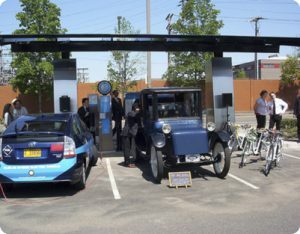 In April 2018 JuicePoint launched the new single or 3 phase 7kW to 22kW JuiceBox 32 EV charger with Type 2 connector. This charger is compliant with the latest WorkSafe requirements and New Zealand electrical regulations. JuicePoint have also registered JuicePoint.com.au to service the developing Australian market.